We send and receive lot of email messages with attachments like photos, documents, pdf files and so on. 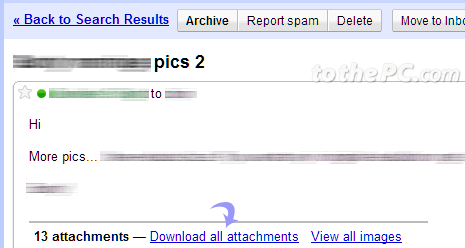 Do you want to view and download all attachments contained in your Gmail account? Unfortunately, there is no quick forward way to do so. However, there are few workarounds to access and download attachments within email messages of your Gmail account. Checkout following to get going with email attachments downloading process. Do you want to download all attachments contained in single email message? You can easily download all attachments using “Download all attachments” feature. Login into Gmail and open email messages with multiple attachments. Click on Download all attachments link. In the pop-up dialog box, click save button to download and save all attachments contained in that email as single ZIP file. You can easily filter out email messages with attachment quickly in your Gmail inbox. Use following Gmail search operators to view messages with attachment files. There are few third party tools that allows you to download email attachments from Gmail account quickly. However, if you perform lot of data transfer from Gmail account while trying to download attachments – Gmail may suspend your email account for such activity. So, be careful while using these tools. 1. 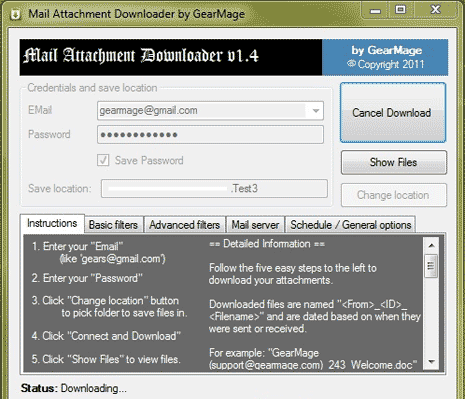 Mail Attachment Downloader is a free program that allows you to download email attachment files quickly. You can specify (hourly / daily) schedule for attachment downloading in the program. All your email messages are left on Gmail mail server, which can be read by you anytime in the future. All email attachment files content is downloaded securely using encrypted channels. This program can be used to download email attachments from Gmail, Hotmail / Live, AOL and Yahoo Mail accounts. 2. Thunderbird addon method allows you to download attachments quickly. You can use specific extension for quick and easy Gmail attachment downloading process. 3. Gmail Drive is pretty old tool [may not work now] for accessing Gmail account in the form of virtual file system. GMail Drive adds a new drive icon to your computer under the My Computer folder. You can open it to create new folders, copy, drag and drop files. You can quickly save and retrieve files stored on your Gmail account directly from inside Windows Explorer. 4. gDisk is like ‘Gmail Drive’ tool for MAC users [may not work now]. It turns your Gmail account into a portable hard drive so you can always have your important files accessible across the Internet. Since this tool is old, it may not work on your latest MAC system. Also, several users reporting crash issue with this tool. Do you know any other tool or method to quickly download all attachments from Gmail account? Share with us for making Techno Life easy! I use KMail download attachments feature to downloads attachments of selected messages. But this method is also slow.